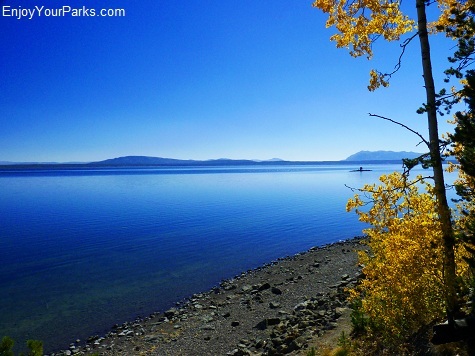 The outlet of Yellowstone Lake in Yellowstone National Park. 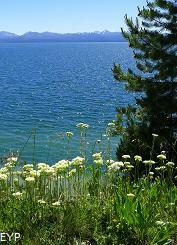 Yellowstone Lake is a big, wonderful lake that you never get tired of looking at. 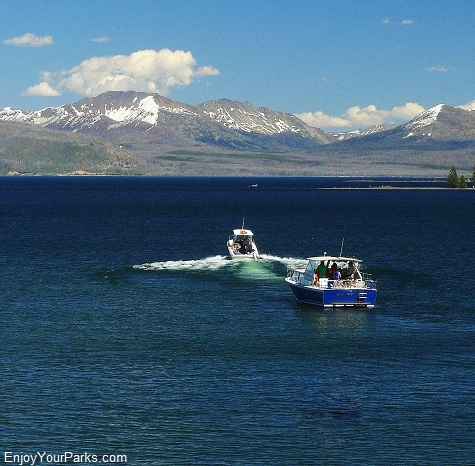 It's truly one of the most beautiful lakes in the world. 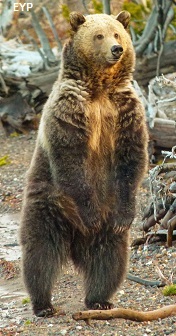 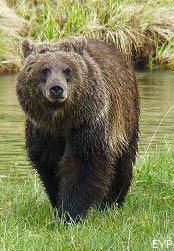 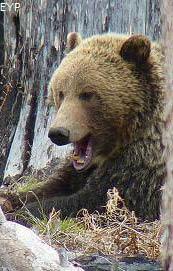 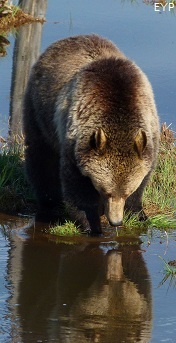 There are definitely grizzly bears hanging around the Lake Area in Yellowstone National Park. 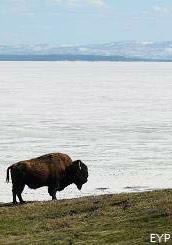 Yellowstone Lake in Yellowstone National Park is very deep and very cold. 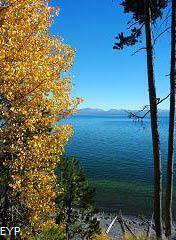 It's 430 feet at it's deepest point, and because of it's high altitude, the temperature of this lake never gets higher than about 38 degrees F, even in the middle of summer! 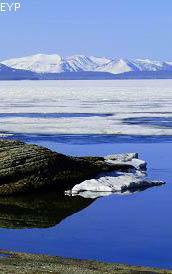 In the winter, the ice can exceed 3 feet in thickness. 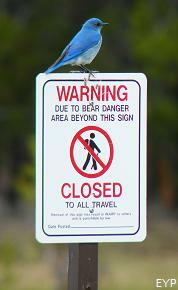 It usually freezes over by December, and will remain frozen until late May or early June. 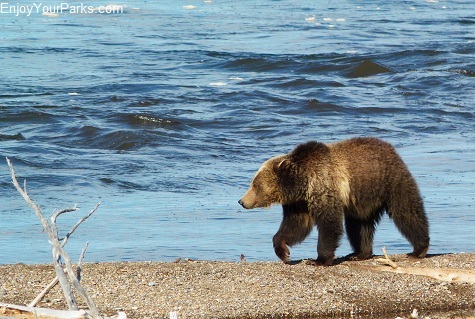 Aside from all of these hopefully interesting facts, Yellowstone Lake in Yellowstone National Park is awe-inspiring, and the deep blue color is truly a sight to behold. 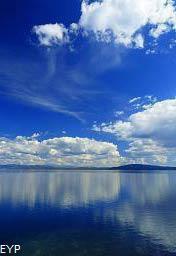 This lake is so big and so beautiful, it will be forever etched in your mind once you've seen it. 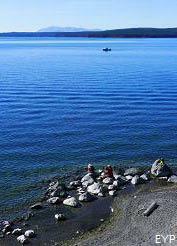 Yellowstone Lake, Yellowstone National Park. 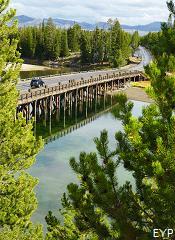 Lake Village in Yellowstone National Park is home to the world famous Lake Yellowstone Hotel and Lake Lodge, and are definitely worth taking a look at during your Yellowstone Park vacation. 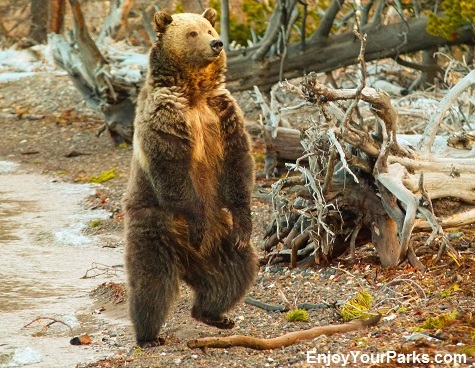 In fact, you may end up staying at one of these historic places on your way through the park! 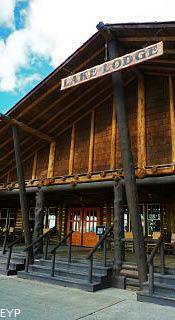 Lake Yellowstone Hotel is a magnificent historical icon of Yellowstone National Park. 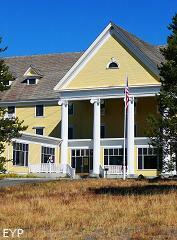 Lake Yellowstone Hotel in Yellowstone National Park was built in 1891, and reached it's present eloquence in the early 1920's. 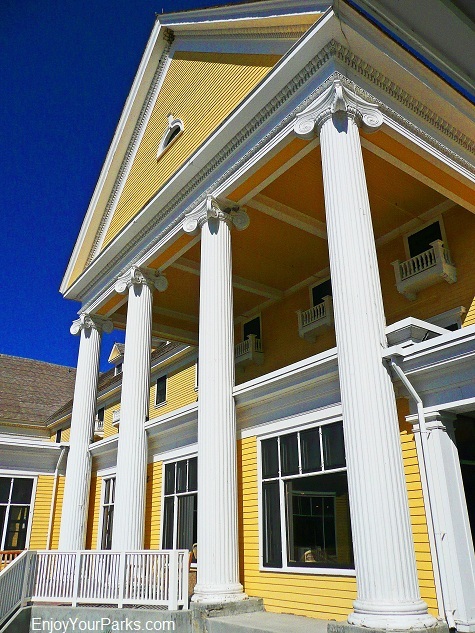 This grand old hotel is of course on the National Register of Historic Places, and if there was only one word to describe it, that word would be "charming". 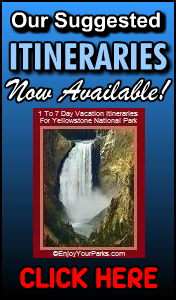 From the golden age of touring Yellowstone National Park via stagecoach to the present time, this historic masterpiece has been a part of many, many generations, and is a timeless legacy of one of the greatest national parks in the world. 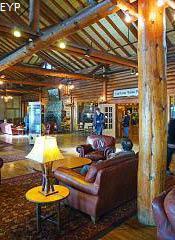 It provides a gorgeous view of the Lake Yellowstone Hotel is the charming Sun Room- you really need to check it out! 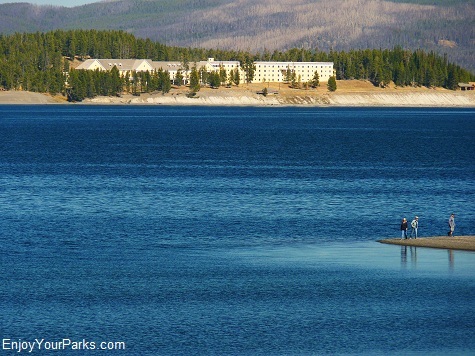 The Lake Yellowstone Hotel, also known as "Lake Hotel", is yet another iconic image of Yellowstone National Park, and is a "must see" while vacationing in Yellowstone. 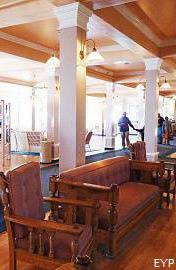 The Yellowstone Lake Hotel's interior has be restored to its actual appearance in the early 1900's. 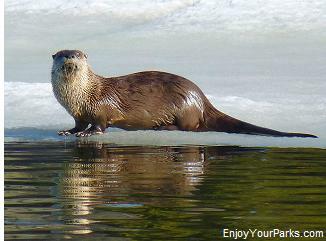 It's absolutely charming! 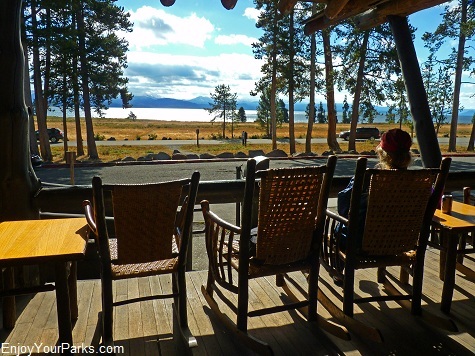 Lake Lodge at Lake Village in Yellowstone National Park has our favorite porch in the entire world! 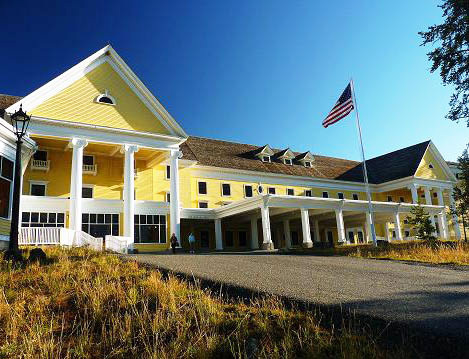 Lake Lodge at Lake Village in Yellowstone National Park is another wonderful Yellowstone Park icon located at Lake Village. 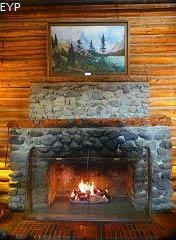 This rustic old lodge is constructed of lodgepole pine logs, and not only has two wonderful fireplaces to sit by, but also has one of our most favorite porches in the entire world! 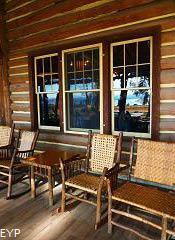 This "perfect porch" gives you an absolutely spectacular view of the lake from the comfort of old hickory rocking chairs. 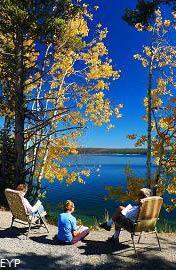 If you want to take in the morning sun and relax as you gaze upon Yellowstone Lake and the mountains beyond, this is the place to be! 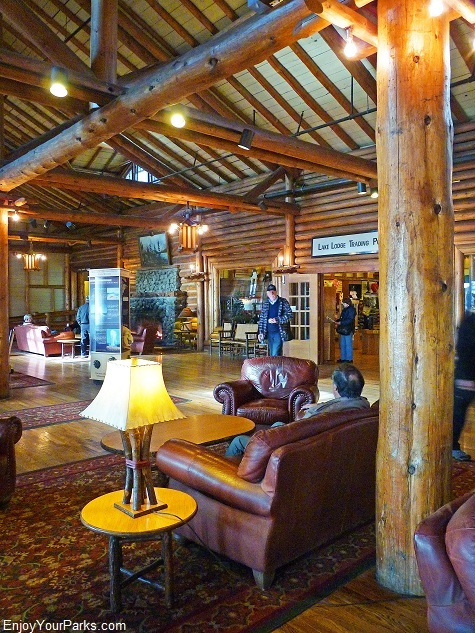 Lake Lodge in Yellowstone National Park has a wonderful "feel" to it. 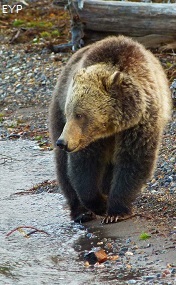 It's warm and cozy, and very "Yellowstone Park". 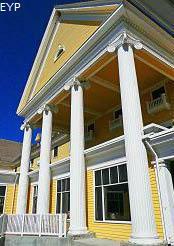 We love spending time in this historic place. 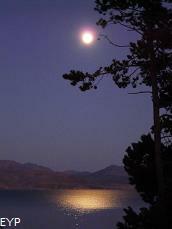 This is our favorite deck on planet earth! 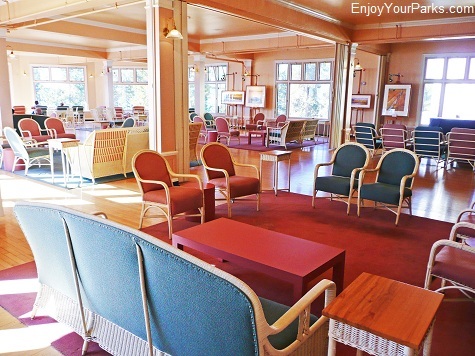 Lake Lodge is a great place to sit and relax with a hot cup of coffee in the morning while enjoying a beautiful view of Yellowstone Lake. 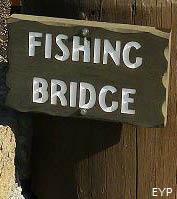 Fishing Bridge crosses the mouth of the Yellowstone River in Yellowstone National Park. 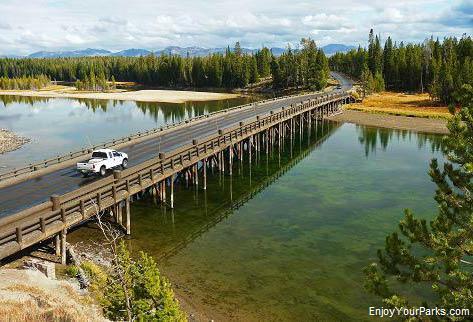 Built in 1902 and only a few miles east of Lake Village, Fishing Bridge was once the most popular place in Yellowstone National Park to catch native Yellowstone cutthroat trout. 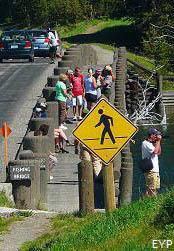 Early photos shows literally hundreds of people with fishing poles fishing off this famous bridge. 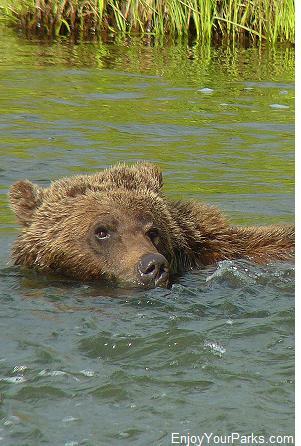 You can still see cutthroat trout swimming in the water below, but fishing is no longer allowed from the bridge. 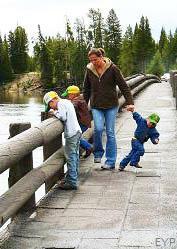 Fishing Bridge is definitely an iconic image of Yellowstone Park with a long, fascinating history. 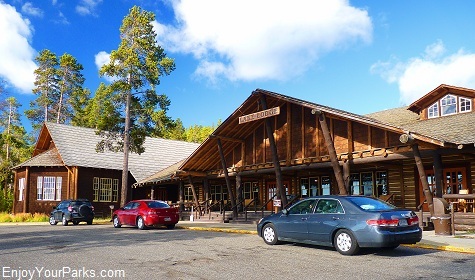 In addition to this iconic bridge, just to the south of it is a fantastic old general store and gift shop, food services, gas station, showers and laundry, and the famous Fishing Bridge Museum, which is on the National Registrar of Historic Places. 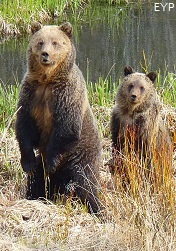 There is also a campground for hard-sided campers only because there are a lot of grizzly bears in this area. 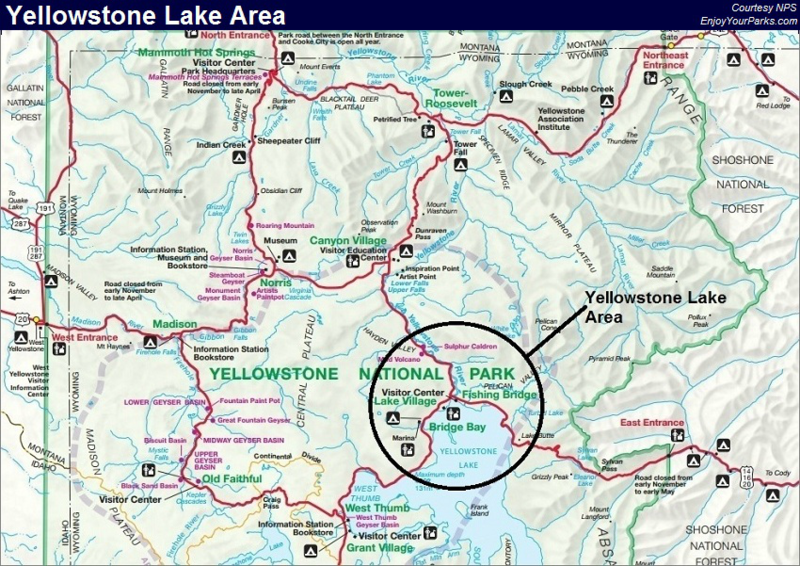 The highway south from Fishing Bridge wraps around a portion of the eastern shore of Yellowstone Lake, and eventually reaches the east entrance past Sylvan Pass, and ends up in Cody Wyoming 53 miles to the east. 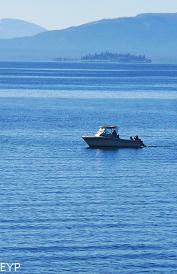 As you are heading south east from Fishing Bridge, the highway wraps around to bays: Mary Bay and Sedge Bay. 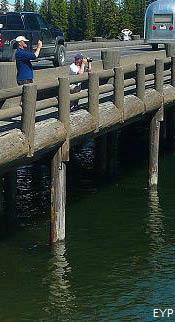 Between these bays is what is known as Steam Boat Point. 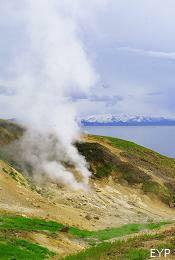 It's a hydrothermal feature that is always steaming, and this pullout provides a very impressive view of Yellowstone Lake! 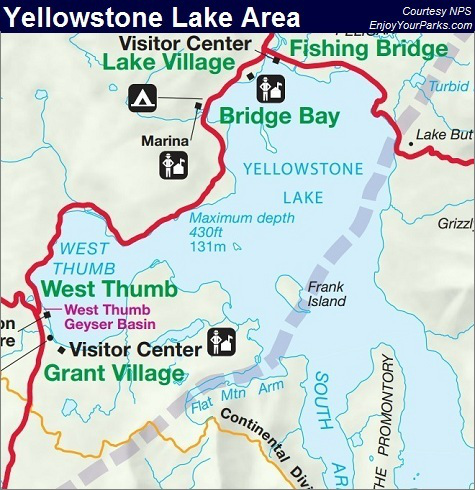 Steamboat Point in Yellowstone National Park is only about three miles from Lake Village, and if you have the time, it's a really nice drive and well worth it. 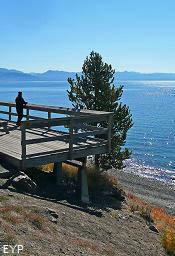 By the way, there are also picnic tables along the bays and near Steam Boat Point so you can have lunch and enjoy the view! 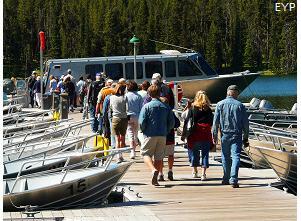 The Bridge Bay Marina in Yellowstone National Park is a really fun place to explore. 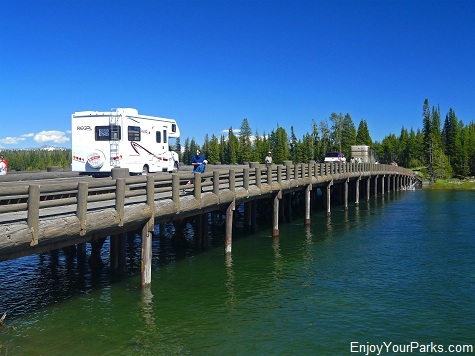 Bridge Bay is located just a few miles to the west of Lake Village in Yellowstone National Park, and it is yet another fun place to explore. 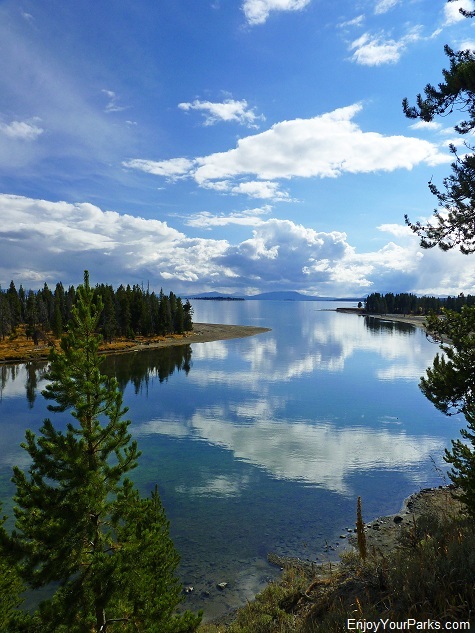 It's a great place to wander the shore of Yellowstone Lake, and it's home to a gorgeous marina that docks many beautiful boats throughout the summer. 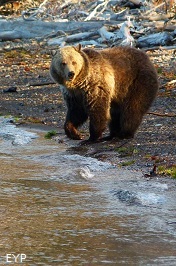 There is also a very nice campground here that is one of our favorites! 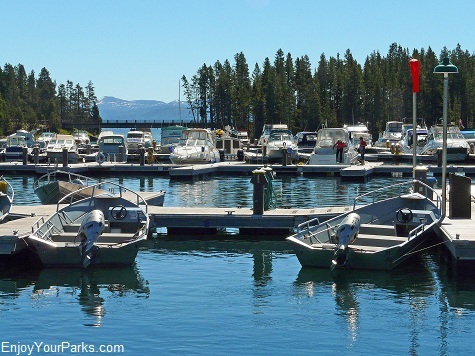 The Bridge Bay Marina is awesome and is a "must see" because it's fun to look at all the boats and watch them come in and out of the bay. 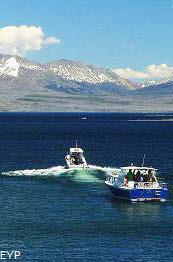 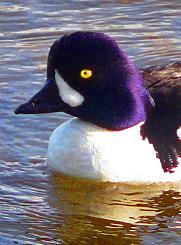 This will entice you to either rent your own motor boat for a few hours or to take a boat tour of Yellowstone Lake. 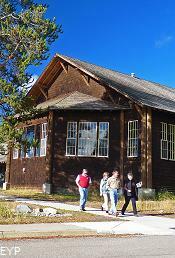 You can even go with a fishing guide and catch some of the fabled native yellowstone cutthroat trout. 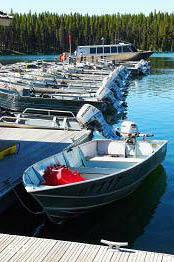 The tackle shop and camp store is also fun to take a look at. 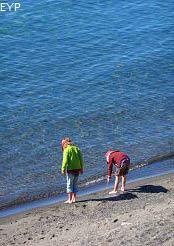 Bridge Bay Campground is a fantastic place to camp. 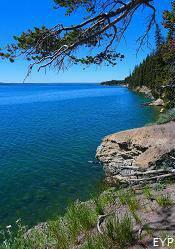 The campsites are really nice and you have great access to the Bridge Bay Marina and Yellowstone Lake. 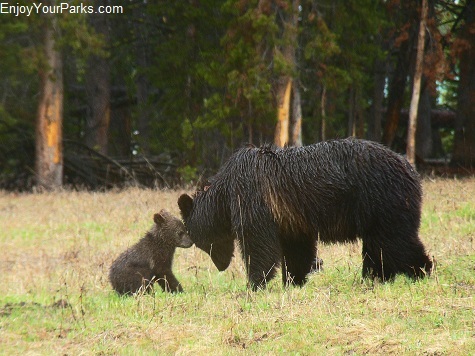 It's one of our favorite campgrounds in Yellowstone National Park. 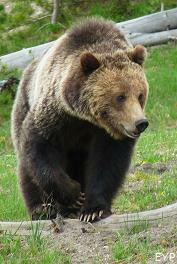 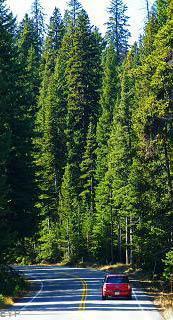 For more information on Yellowstone Park Campgrounds, click here. 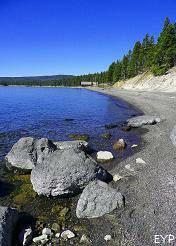 This is a view of Lake Yellowstone Hotel from Gull Point along Yellowstone Lake in Yellowstone National Park. 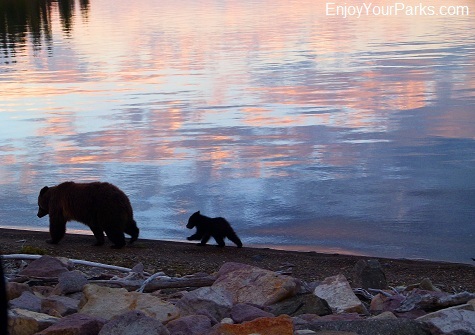 Grizzly bear sow and cub walking along Yellowstone Lake in the early morning. 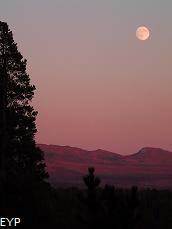 A very magical moment. 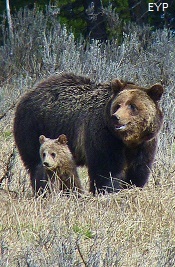 We photographed this grizzly sow and cub just a few hundred yards from Lake Lodge in Yellowstone National Park. 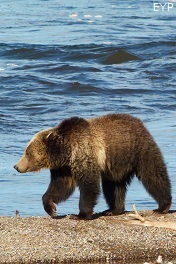 Grizzly bear literally "walking" along the beach on Yellowstone Lake near the Yellowstone Lake Hotel in Yellowstone National Park. 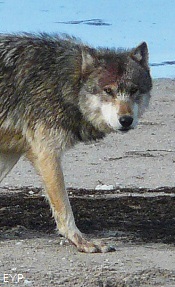 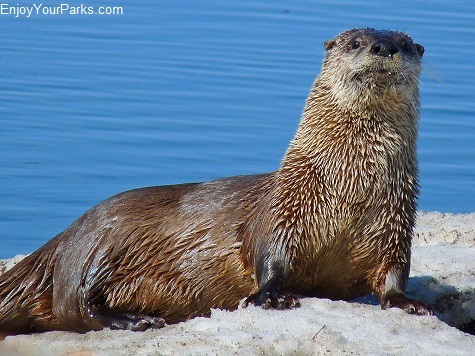 In addition to grizzly bears, there are many other wildlife species that inhabit the Lake Area in Yellowstone National Park, such as river otters, wolves, black bear, and dozens of waterfowl and other birds. 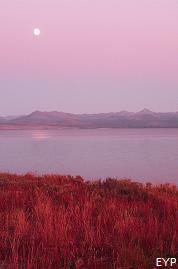 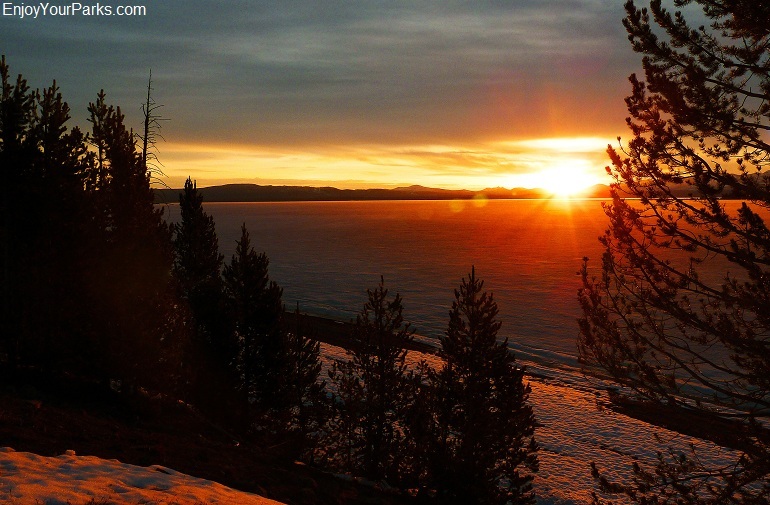 The Yellowstone Lake Area is a wonderful, magical area that you will truly enjoy exploring. 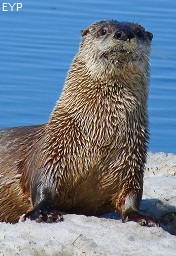 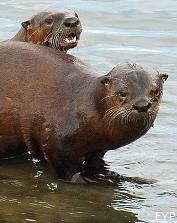 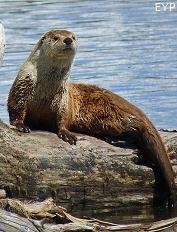 River otters love Yellowstone Lake in Yellowstone National Park, and are frequently seen fishing for Yellowstone cutthroat trout near the shore.